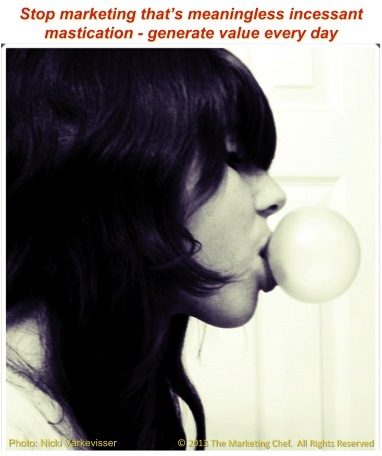 Chewing on a piece of bubble gum that’s lost its flavor requires us to stop and be conscious of the unproductive habit. Similarly, masticating on marketing that’s lost its value requires us to pause and become intentional in both observation and measurement. Ask every customer how he or she heard about you. Do it consistently. Seems obvious? Yet I find that more than eight out of ten small business owners forget this small, simple step. Refer each of your marketing channels to a specific URL, perhaps even use unique URLs. Don’t just dump people onto your home page through all your other marketing. For example, although my main site is www.TheMarketingChef.com, www.AndrewSzabo.com takes you specifically to my blog, www.BookAndrew.com directs you to the speaking video while www.Irresitible-Marketing.com goes to my signature product. Monitors the activity on your website including unique visitors, repeat traffic, page views, source and much, much more. Listen to what others are saying about you, your organization or your products when you are mentioned on the trillions of pages that Google tracks. Track social media mentions, retweets, conversations and topics of interest. These are the five top must-do marketing measurement tools that will cause you to pause and consider what you’re doing everyday. There is no excuse, they’re all free to get started. What’s the next five on my priority list? Other Web analysis and social media analytical tools to measure engagement, influence and best practices: for example: Bitly, Grader, Yoast, SEOpresser, Klout, as well as the tools integrated into Facebook, LinkedIn, Google+ etc. Break the Marketing Mastication Habit! So chew on this. 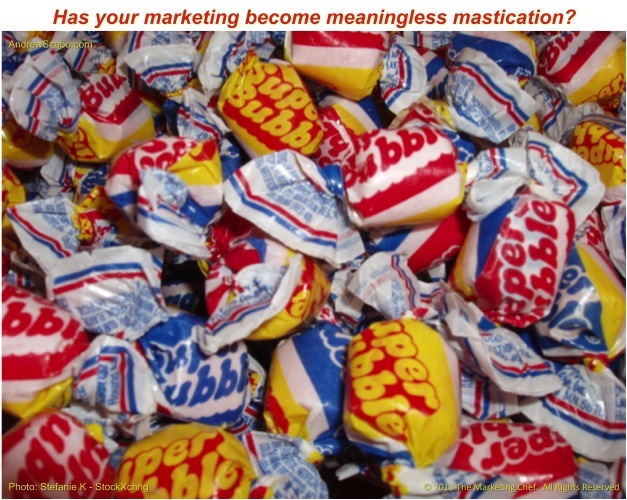 Stop marketing that is meaningless mastication and begin to measure marketing success. Well, almost always when you are mentioned! © 2013 Andrew Szabo – The Marketing Chef. All Rights Reserved.